Some personal pictures of Tavira here My map of Tavira here. The information on this page has been obtained from printed timetables and other local sources (like taking the bus) and is given in good faith. NO SERVICE on Saturday afternoons, nor all day Sundays and Holidays. No service at Pedras d'el Rei at weekends or holidays. 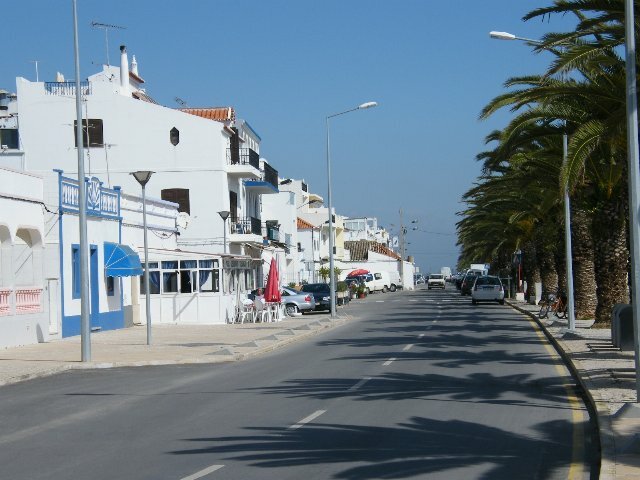 ** from here it is a short walk to the bridge or little train crossing to the Praia do Barril. A small ferry operates between April and mid September across the lagoon to the island beach of Terra Estreita. Buses to and from Cabanas do not run on Saturday afternoons, nor all day Sundays and Holidays. ** Cabanas end stop is at the roundabout at the entrance to Cabanas Park and the Golden Club resorts. is closer to the centre of the village and the ferry to the island. 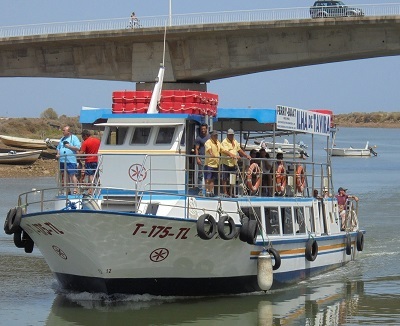 In July, August and early September there are passenger ferries from Tavira to Cabanas. Ilha Cabanas / Cabanas island from town. each way. Starts 9am ends according to time of year. Water taxis are also available at about 10 Euros each way. There is NO road access to the island. Quatro Águas is about 1 mile/1.6km from Tavira. These buses pass the railway station about 2 minutes after/before the time at Tavira Bus Station. 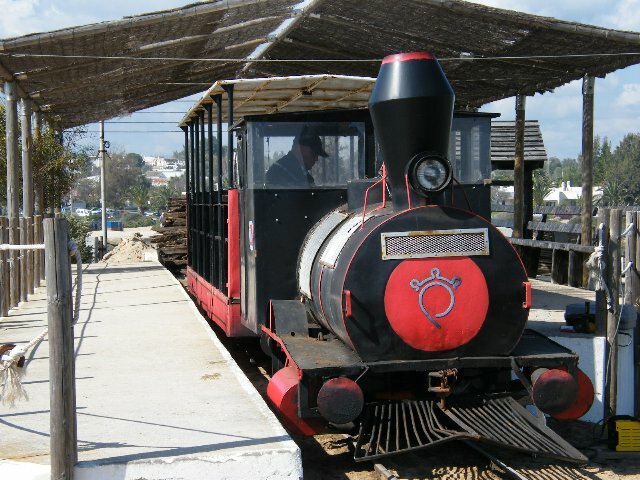 The Tavira tourist road 'train' also goes to Quatro Águas, about once each hour and every day in summer. Some details here or ask at the tourist office about this. The afternoon and evening trips do not run ´without customers'. SPECIAL NOTE - THIS FERRY IS CURRENTLY (16th April 2019) NOT OPERATING BECAUSE OF REPAIR WORK AT THE ISLAND DOCK. The ferry between Quatro Águas to the island operates daily all year, except when the weather is bad. In high summer (July and August) it operates frequently from 0800 until midnight. In June and September there is a boat at least every hour from around 0830 to 2000, often two each hour. Return fare (adult) is €1,50. Complete timetable here - opens in a new window, but only the current months times are shown. They run extra boats if demand requires. Ferries operate until late evening during July and August. There is limited free parking at Quatro Águas; additional parking (1 Euro per hour) is available in summer. Quatro Águas is about a mile (1.6km) from town. There are additional ferries in the summer. These leave from the quayside in Tavira just beyond the old market building, the Doca da Pesca and the fishing boats, going towards the tall bridge over the river. These operate at least once an hour. Picture to the right is the ferry approaching Tavira. Click to see full size. Silnido ferry fare €2.00 (adult) return, children half price. This service runs from early June to the end of September, with ferries every 30 minutes at the busiest times. 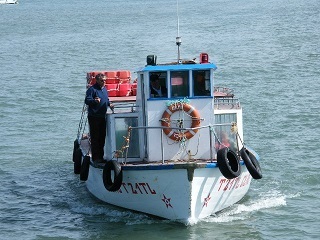 In summer there are also ferries between Tavira (town) and Cabanas operating 0900 - 2000 (1900 in September). The posh Albacora Hotel also runs its own boats from the hotel jetty across to the island. THESE ARE FOOT PASSENGER FERRIES ONLY. BIKES AND DOGS ARE NOT CARRIED AS NEITHER ARE ALLOWED ON THE ISLAND. THOSE LESS ABLE MAY HAVE DIFFICULTIES. WHEELCHAIR ACCESS TO THE FERRIES IS NOT POSSIBLE. There are also water taxis available to take you to the island from Tavira and Quatro Águas, also to and from Cabanas etc. These operate restricted hours outside the main holiday season. Check carefully for which days the buses operate. A scenic ride but come back a different way! SCH - Schooldays only but not on Wednesdays! From Tavira on WEEKDAYS (MFO) at 1325 and 1825**. Also on at 1630 SCHOOLDAYS. The 1825 bus continues to Brejos (Cruz.) arriving at 1845. ** only in winter! In summer the bus leaves at 1920hrs. From Tavira on SATURDAYS only at 1350hrs. No buses on Sundays and Holidays. There are more buses between Tavira and Luz de Tavira - click here for times. 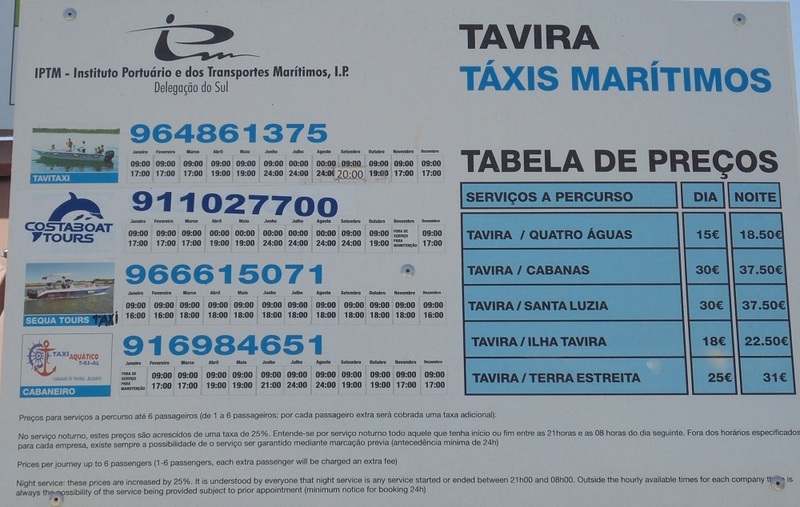 Tavira has two overlapping, local urban minibus routes from the Bus Station.They make a couple of loops around the town and suburbs, at very irregular intervals, between 0800 and 2000 MFO (weekdays) only. Five journeys also run on Saturdays on Linha Azul between about 0800 and 1400. There is no service at all on Sundays or Holidays. Times are posted at the most of the bus stops. Maps and timetables on line here. Click either Descarregar Horário Linha Azul or Descarregar Horário Linha Vermelha for a printable timetable.There is a stop outside the Tavira Gran Plaza shopping centre, number 23 on the map. The routes are very complicated with many stops only served on a few journeys. 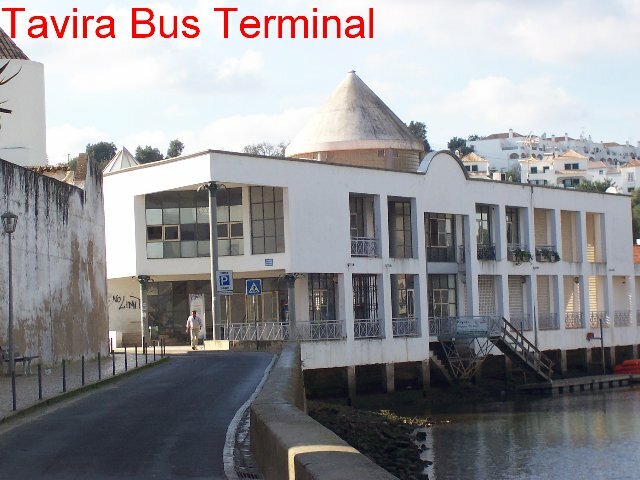 Tavira Bus Station is situated in the Rua dos Pelames, on the riverbank, about 3 minutes walk from the town centre, the old arched bridge and the Praça da Republica. It is about six or seven minutes walk from the Railway Station - signs to it say "Terminal Rodoviário". My map of Tavira here. Steve Widdowson kindly sent me some more pictures, taken in October 2014. Nothing changed since!